How someone with synesthesia might perceive (not "see") certain letters and numbers. yet simultaneously perceive colors as associated to each one. Synesthesia is a neurologically based phenomenon in which stimulation of one sensory or cognitive pathway leads to automatic, involuntary experiences in a second sensory or cognitive pathway. People who report such experiences are known as synesthetes. In one common form of synesthesia, known as grapheme -> color synesthesia or color-graphemic synesthesia, letters or numbers are perceived as inherently colored, while in ordinal linguistic personification, numbers, days of the week and months of the year evoke personalities. In spatial-sequence, or number form synesthesia, numbers, months of the year, and/or days of the week elicit precise locations in space (for example, 1980 may be "farther away" than 1990), or may have a (three-dimensional) view of a year as a map (clockwise or counterclockwise). Yet another recently identified type, visual motion -> sound synesthesia, involves hearing sounds in response to visual motion and flicker. Over 60 types of synesthesia have been reported by people, but only a fraction has been evaluated by scientific research. Even within one type, synesthetic perceptions vary in intensity and people vary in awareness of their synesthetic perceptions. While cross-sensory metaphors (e.g., "loud shirt," "bitter wind" or "prickly laugh") are sometimes described as "synesthetic," true neurological synesthesia is involuntary. It is estimated that synesthesia could possibly be as prevalent as 1 in 23 persons across its range of variants. Synesthesia runs strongly in families, but the precise mode of inheritance has yet to be ascertained. Synesthesia is also sometimes reported by individuals under the influence of psychedelic drugs, after a stroke, during a temporal lobe epilepsy seizure, or as a consequence of blindness or deafness. Synesthesia that arises from such non-genetic events is referred to as "adventitious synesthesia" to distinguish it from the more common congenital forms of synesthesia. Adventitious synesthesia involving drugs or stroke (but not blindness or deafness) apparently only involves sensory linkings such as sound -> vision or touch -> hearing; there are few, if any, reported cases involving culture-based, learned sets such as graphemes, lexemes, days of the week, or months of the year. Although synesthesia was the topic of intensive scientific investigation in the late 1800s and early 1900s, it was largely abandoned by scientific research in the mid-20th century, and has only recently been rediscovered by modern researchers. Psychological research has demonstrated that synesthetic experiences can have measurable behavioral consequences, while functional neuroimaging studies have identified differences in patterns of brain activation. Hypnosis can alter the way certain individuals information process information in their brain. 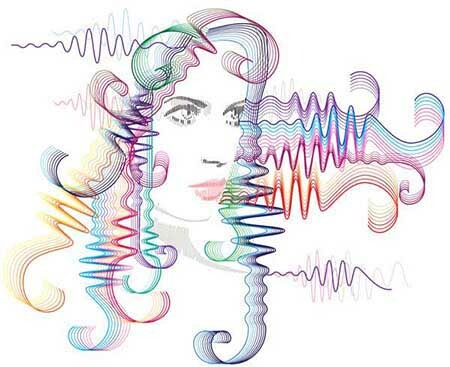 A new phenomenon was identified by researchers who have successfully used hypnosis to induce a functional analogue of synesthesia. The discovery can open a window into the previously unexplored domains of cognitive neuroscience. Synesthesia is generally understood to be a rare phenomenon where, for example, seeing a certain letter or number is uniformly accompanied by an automatic association to or a visual perception of a color. Imagine a calendar. Chances are you just thought about a rectangular grid, with time progressing from the top-left to the bottom-right. But around one percent of you may have pictured something different - a V, for example, or a hoop encircling your head. These weird shapes are called "calendar forms." They're a type of synesthesia - the mental phenomenon where people involuntarily map one type of sensation onto another. Some associate letters or numbers with colors, others taste sounds or see smells, and people with calendar forms map time onto space. Sure, everyone does that to an extent - for example, we might picture numbers on a line going from left to right. But calendar forms are especially vivid and perceptually real - people actually see the units of time occupying the space around their bodies. People with an unusual condition called synesthesia, which makes them experience a "mixing" of their senses, may automatically form stronger mental links between the sound of a word and the image that word conjures up in their mind, according to a small new study. About 1 to 4 percent of people have synesthesia. In one of its most common forms, people who are looking at colors might associate them with certain letters, or numbers, or sounds. For example, a person with synesthesia might always perceive the letter "Y" as blue or yellow, even when that individual sees it in black print. Often science dismisses what it doesn't yet grasp, until technology or some other breakthrough turns the tide. Before the advent of MRIs, for example, if someone said they could taste a texture or hear spoken words in color (examples of a condition in which the senses are intermingled known as synesthesia), conventional wisdom held that it had to be a metaphor, similar to remarking that a certain wine is 'full bodied' or that 'I feel blue today.' But it's no metaphor - neural scans show that the brains of people with synesthesia light up in distinctive ways corresponding to the sensory overlap they report. People with autism may be more likely than others to have synesthesia, a condition in which people experience a mixing of their senses, such as hearing tastes and shapes, and seeing numbers in colors, a new study from Europe suggests. Researchers tested 164 people with autism and 97 people without autism by giving them online questionnaires designed to evaluate whether they had synesthesia. They found synesthesia occurred in about 7 percent of people who didn't have autism, a figure within the range of previously reported rates. In contrast, 19 percent of people with autism appeared to have synesthesia. Most synesthesia studies rely on a phenomenon in color psychology known as the Stroop Effect. It presents the test taker with a list of colors - Yellow, Green, Blue - each written in a typeface of a different color than what the word says. The word yellow may be written in red ink, for instance, and the word blue may actually appear yellow. The person taking the test has to say the color of the text, not read the word. Most of the time, it's difficult. But for synesthetes, the task isn't as hard because colors and words already have concrete associations in their brains. They have an easier time 'hooking' onto the desired color. Hoping to mimic these effects, a team led by neuroscientist Daniel Bor recruited 14 people to undergo extensive training in the lab. For weeks, the participants read from specially designed colored e-books and spent half-hour chunks of time learning 13 letter-color associations. The goal was to engrain these cross-dimensional concepts as one codified unit, much like actual synesthetes taste words and see sound. By the five-week mark, many of the participants had begun seeing colored letters instead of black text in their lab tests. Someone with the condition known as grapheme-color synesthesia might experience the number 2 in turquoise or the letter S in magenta. Now, researchers reporting their findings online - have shown that those individuals also show heightened activity in a brain region responsible for vision. The findings provide a novel way of looking at synesthesia as the product of regional hyperexcitability in the brain, the researchers say. They also provide a window into our understanding of individual differences in perception. Not only do these grapheme-color synesthetes really see the colors they report, as measured in behavioral tests, but functional magnetic resonance imaging (fMRI) of their brains also shows activation in the color-selective regions of the cortex when they view black-and-white letters or numbers.